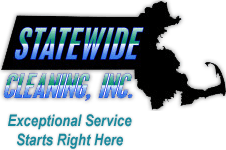 Statewide Cleaning prides itself as a complete cleaning workshop on wheels. Coupled with our broad experience in the professional cleaning industry, we provide suburban Bostonians with a very high level of service.Professional, friendly, on time, and very accurate hard work…that’s what we are all about. We also have a full array of VCT tile cleaning and maintenance services. These include:Full Stripping and Refinishing: We will remove layers of old discolored floor finishes by aggressively stripping them off with rotary floor equipment. After rinsing and neutralizing, we will replace that finish with the appropriate coats of high-solids sealers and high-gloss top coats.Interim Maintenance: We will perform cleaning and buffing services in between your major jobs, and periodically lightly machine scrub and coat the floors again as needed.